This deep coloured with an attractive brilliance Côtes du Rhône from Jaboulet develops a elegant and aromatic bouquet, with red fruits blended with spices. On the palate it is well-structured on rounded tannins, with a final spicy note. 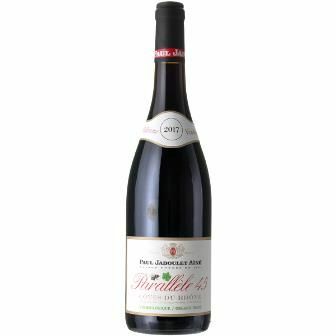 The « Parallèle 45 » is a perfect balance between the two great grape varieties of the Rhône valley : Syrah and Grenache Noir. This wine, very successful, has seen its production increase sixfold in ten years (2,000,000 bottles in the year 2000).The vinification traditionally takes pace in vats, fermentation is controlled following our own winemaker’s technique. Ageing continues in vats then in bottles in Jaboulet cellar, enabling us to sell these wines was they are stable and refined. The name comes from the 45th latitudinal parallel that passes at Pont de l’Isère, 2 kilometres south of our cellars. A small monument indicates this demarcation, where one can read « Here begins the south ».